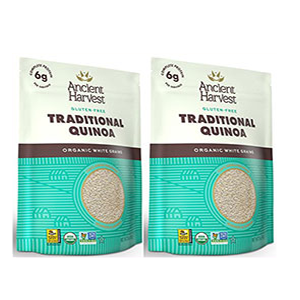 Quinoa is a whole grain variety that originated in the Andean highland regions of Peru and Bolivia, where it was utilized as a staple food source by pre-Columbian civilizations. Pronounced "keen-wah", it remained relatively unknown to the rest of the world until about the 1990's, when it was popularized to a significant degree by trending Western macrobiotic, vegetarian and vegan-based diets. Author Donna Gates and her book "The Body Ecology Diet", first published in 1995, also played a significant role in introducing quinoa to many health seekers in California and other parts of the U.S.
Back then, it was chiefly found in local health food stores and only imported from 2-3 main South American producers. Today, quinoa is widely available at many large chain supermarkets from well over 50 different suppliers. Becoming increasingly popular among a more mainstream audience for its higher protein to lower carbohydrate ratio, it has also taken center stage as one of the top gluten-free grains advocated for those with gluten intolerance, wheat allergies or celiac disease. Although it is often referred to as "Incan rice", the Incan peoples actually adopted its dietary use and cultivation techniques from preceding Andean Quechua and Aymara cultures. 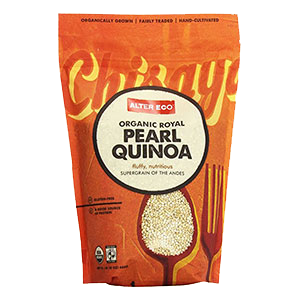 The Incas referred to quinoa as "chisaya mama" or "mother of all grains" and considered it a sacred food in which the first crops of the season were sown ceremonially with golden implements. 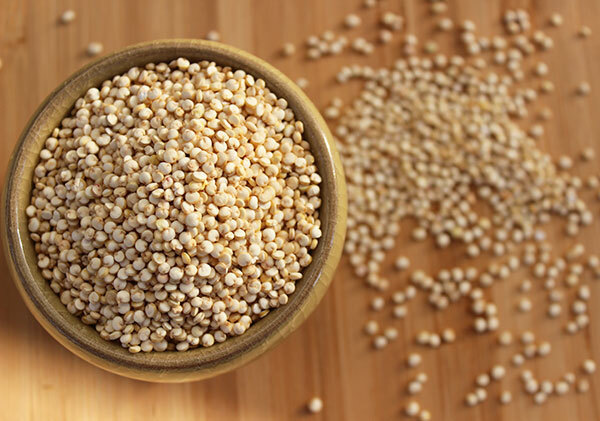 Quinoa, like the two other Incan grain varieties kañiwa and kiwicha (or amaranth), is known for its greater balance of essential amino acids compared to other grain types. 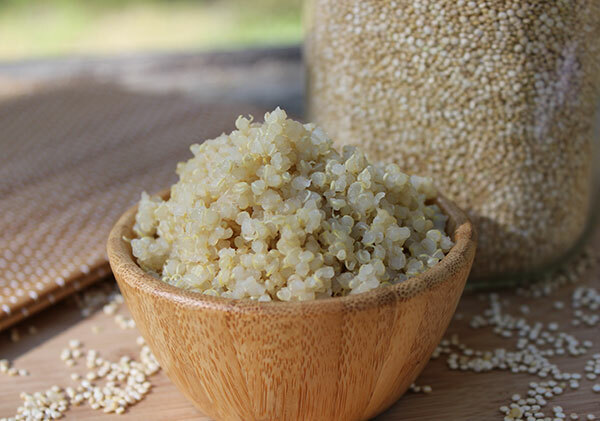 Although it is considered a whole grain, quinoa is often called a "pseudocereal" because, unlike other cereal grains, it is actually a seed that comes from a non-grass species. It belongs to the family Amaranthaceae (or goosefoot family) which includes other plants like lamb's quarters, beetroot, chard and spinach. It is also closely related to the mentioned kañiwa seed (Chenopodium pallidicaule) and many of the amaranth or Amaranthus species. Wild variations of Chenopodium quinoa are native to the Andean region of South America and have been identified to have originated near Lake Titicaca bordering Peru and Bolivia, an area that was once home to the Incan peoples. The word "quinoa" in fact is derived from the common ancestral Andean Quechua language and the terms "kinwa" or "kinuwa." It is an annual flowering weed-like plant that grows approximately 3-7 ft (1–2 m) tall. The tiny seed grains are about 0.08 in (2 mm) in diameter and usually a cream off-white color. Depending on the cultivar, the plant however can also produce different colored grains. The two most common variations sold in the marketplace are black and red quinoa. These are often blended with white grains and sold as a tri-colored variety. 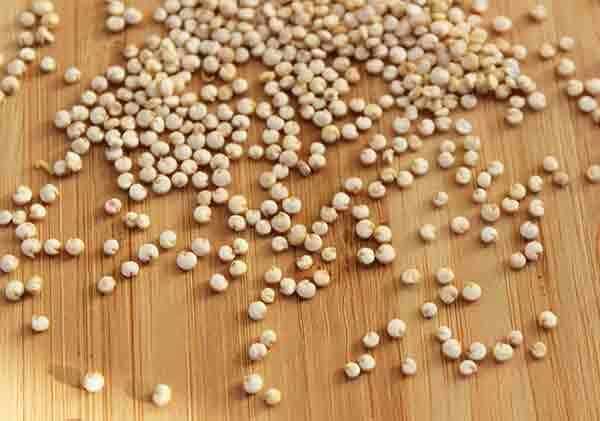 Uncooked quinoa seed has a flat rounded shape and, when completely steamed in water, pop open to form tiny rounded grains with a white curled germ falling off of them and a comparable texture to that of couscous or bulgur wheat. Quinoa has a slightly bitter taste but pleasant buttery rich pasta-like flavor because of its higher protein content. Bitterness can be reduced by pre-rinsing the grains before cooking them and/or soaking them for a brief amount of time. 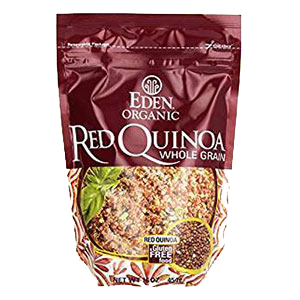 Cultivated red and black selections, have a rather different taste, a slightly denser quality and more fiber content than white quinoa. These colored grains are mainly pigmented on the outside of the seed, but when cooked produce a cream-colored center and curled germ. Like wild lamb's quarter, the leaf of the quinoa plant (called "llipcha" in the Quechua language) is also edible and traditionally cooked like spinach, but can also been consumed as a raw salad green. Quinoa seeds are known to have a thick saponin coating around the seed hull which acts as a natural pesticide to defend it from birds and other predators. 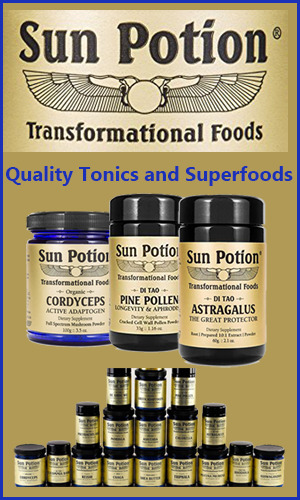 While saponins in small amounts are health enhancing substances, called triterpene saponins, often found in herbs like gynostemma and various other superfoods, when consumed in large quantities they can be potential "antinutrients." This is due to their soap-like qualities which may cause mild gastrointestinal irritation and digestive upset. They also have a strong bitter-tasting flavor that is less palatable to some people. Because saponins readily dissolve in water, rinsing the seeds before cooking them is a good way to remove most of the saponins encasing the seed. 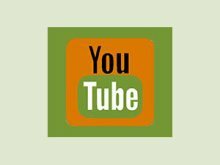 List of top organic suppliers and their saponin removal procedures. This can be achieved through either water washing or through a dry processing technique that usually involves a dehulling process. Both methods will invariably leave a small amount of saponin content, so it's a good idea to always briefly pre-rinse the grain before cooking. Quinoa was one of the primary staple foods of the Andean peoples long before the Incan civilization. In Andean locations, quinoa grain was traditionally steamed like rice and added to various dishes, soups and stews. It has also been used to make "chicha", a homemade fermented drink in regions near Lake Titicaca. In Peru, the dry seeds are heated in a hot skillet and consumed as a type of mini-popcorn. Quinoa is also used straight or toasted and ground to make flour for use in various recipes and to fortify baked breads. In regions near Cusco and the Bolivian highlands, it is used to make "peske de quinoa" or "pesque", a spicy thick risotto-like dish. 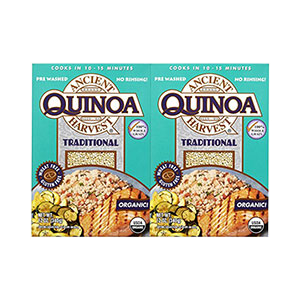 Archaeological evidence actually indicates that Andean quinoa was domesticated long before the Incan civilization. In the book Quinoa: Sustainable Production, Variety Improvement, and Nutritive Value in Agroecological Systems, it was identified that pre-Incan native populations grew quinoa and also "practiced intensive agriculture, using irrigation, composting, rotations, and construction of terraces to conserve soil fertility in the mountains and to increase agricultural production, especially in the areas surrounding Lake Titicaca." Over thousands of years, wild Chenopodium quinoa has been developed into many cultivated subspecies that are adaptable to a number of different climate zones and elevation ranges. There are therefore many "landraces" or local crop varieties of quinoa seeds, especially between Cusco, Perú and Lake Poopó, Bolivia where it has long been domesticated, maintained and controlled by generations of Andean farmers. 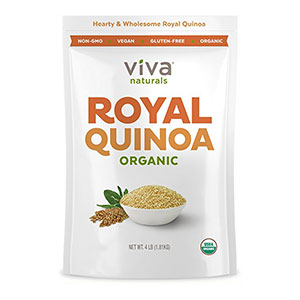 Certain Bolivian heirloom varieties, like "royal quinoa" or "royal pearl", are grown at higher elevations above 12,000 feet and believed to be superior in both taste and nutritional quality. 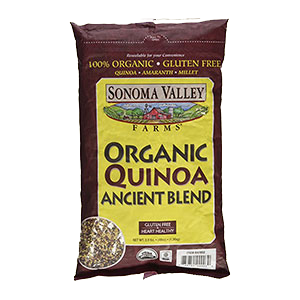 Back in the late 90's, we remember purchasing a pound of organic quinoa for less than $1.50, a little more than most grains at that time. Then, over the next decade, it slowly increased to about $2.99 a pound which remained consistent for many years. After 2013, the price soared considerably as popularity reached an all-time high. 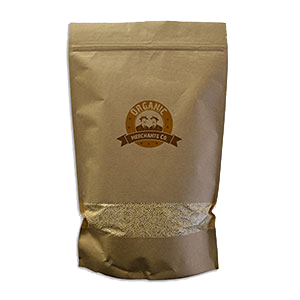 Currently as of 2017, bulk organic quinoa is usually sold at a price range between 5.99 and 8.99 in California and other U.S. locations. Pre-packaged whole grains are notably more expensive than purchasing it in bulk quantities. Most economists believe the nearly tripled price of quinoa since 2006 is a classic example of supply and demand. The top South American producers, predominantly Bolivia and Peru, are simply not able to meet the demand which makes it more expensive. Price increases are also claimed to be necessary to provide a sustainable livelihood for many of these small-scale quinoa farming operations. Crop expansion in other parts of the world is ongoing, but there have been some limitations apparently as far as seed distribution and sharing of quinoa germplasm as some farmers are understandably reluctant to share their unique seed cultivars. In addition, we have found from our research that it is a crop that can be somewhat hard to introduce and establish successfully, especially in completely new terrains or among farmers used to growing other food staples. Today the top producers are still Bolivia, Peru followed by Ecuador and the U.S, particularly California and Colorado. In research documented in the previously mentioned book Quinoa and the chapter entitled "Nutritional Properties of Quinoa", it was stated that "The protein content of quinoa ranges from 8% to 22% among different varieties." This variability is believed to be dependent on the specific genotype as well as the environment and climate in which it is grown. About 60% of the protein content is found in the seed embryo, approximately 40% in the perisperm, and a small amount in the bran or outer seed coating and pericarp. Along with teff, wild rice and amaranth, quinoa is a few grams higher in protein compared to other grain varieties. It also uniquely offers a higher protein to lower carbohydrate ratio as well as a balanced essential amino acid profile, providing a complete protein source. Most grains are low in the essential amino acid lysine which helps the body to absorb calcium, build muscle, repair tissue and produce hormones. One cup of cooked quinoa contains over twice the amount of lysine as the same proportion of brown rice (193mg lysine). 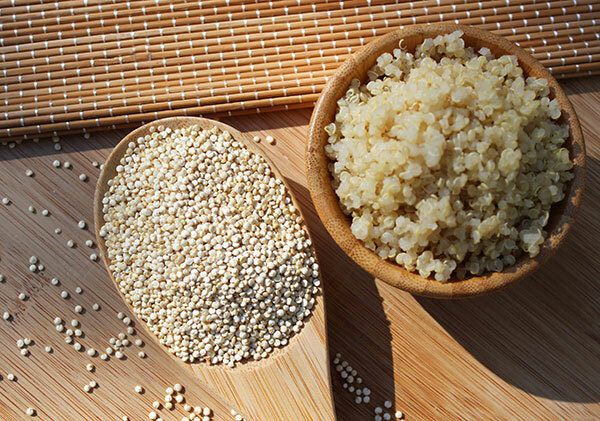 The 442mg of lysine found in a 1C serving of quinoa is also substantially higher in contrast to white rice (153mg), millet (117mg), couscous (115mg) and about 153mg higher in lysine than buckwheat groats. Along with leafy green vegetables, spirulina and hemp seeds, quinoa is a choice plant-based protein-rich food to include in the diet whether vegan, vegetarian or seeking to reduce animal meat consumption. 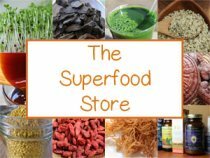 While the concept that plant proteins are incomplete or inferior to "complete" animal-derived foods has been largely dismissed as false information by most holistic health nutritionists, when adhering to a vegan diet it is good to consume a varied combination of plant-based foods to ensure one's essential protein requirements are being met. One cup of cooked quinoa (8g) contains about the protein equivalent of one large cooked egg (7g), one ounce of cooked skinned chicken breast (8g) and one ounce of salmon (7g). 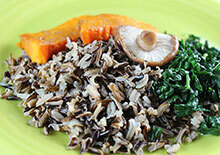 Other grains also worthy of mentioning for their higher protein amounts include teff, amaranth and wild rice. Although most of these also have a greater ratio of carbohydrate content, they may also provide additional replacements to gluten-based selections. 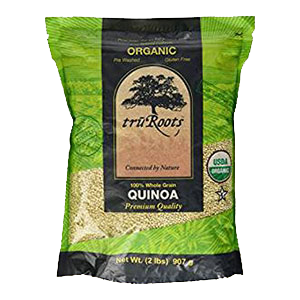 We have personally been eating quinoa for over 25 years as a staple food, enjoying it as a substitute for cooked rice and pasta. Being a gluten-free alternative, it is lighter, less mucous forming, and usually well-assimilated for those with allergic sensitivities. Gluten allergies, both mild to extreme cases, can cause minor gastrointestinal upset to abnormal immune responses. In the case of celiac disease, considered an autoimmune condition, the lining of the small intestine is damaged which can result in malabsorption issues and a host of related problems including diarrhea, skin eruptions, anemia and general fatigue. You don't have to worry about all this with quinoa, however, as it contains no gluten storage proteins, unlike wheat, barley or rye. 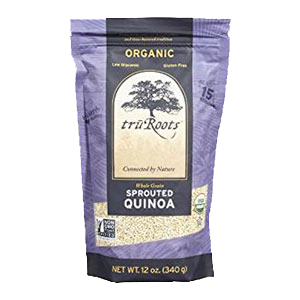 According to reported evidence in Frontiers in Plant Science, "The main protein fractions in quinoa seeds are globulins and albumins" (*) as opposed to prolamins and glutelins. In the journal article entitled "The Gluten-Free Diet: Testing Alternative Cereals Tolerated by Celiac Patients", it was reported that studies on amaranth and quinoa demonstrated "high quality protein in terms of digestibility, efficiency ratio and nutrition balance, almost equivalent to that of milk protein casein." They also indicated a rich content of polyunsaturated fatty acids as well as bioactive compounds such as polyphenols and flavonoids. Quinoa became especially popular in the U.S. in the mid 1990's with the book "The Body Ecology Diet", published by author Donna Gates who advocated its use as a more "alkaline-forming" grain variety. This is generally because quinoa contains more alkaline minerals, like magnesium and iron, and also has a lower refined carbohydrate content or glycemic index. Other common staples, like corn, rice, oats and wheat, all tend to be acid-forming in the body after consumption. 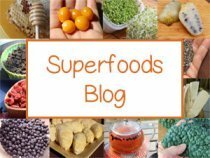 Alkaline-forming foods are believed to lower blood acidity and balance body pH which can be helpful for establishing a healthy equilibrium of gastrointestinal bacteria, especially in the colon region. 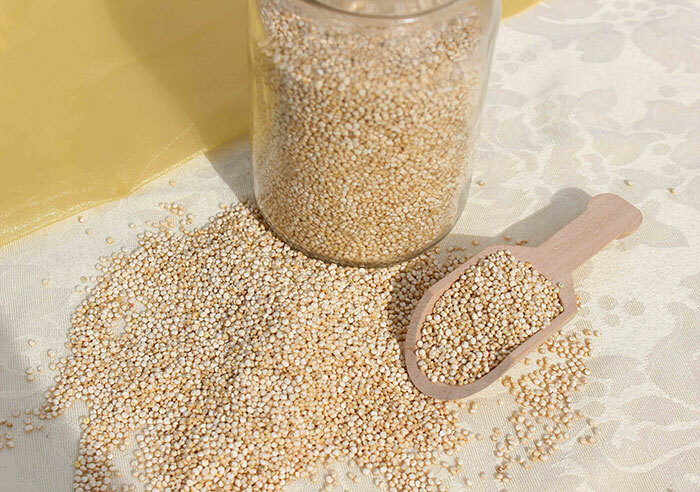 Along with millet and amaranth, it still remains on the top of the list of "BED grains" to select from for those recovering from candida overgrowth, a fungal strain of yeast that thrives under acidic conditions. With its higher protein ratio, it also provides a healthier alternative over acidic meat-based protein sources. One of the claimed reasons for this attribution, along with the crops tolerance for a number of different growing conditions, was quinoa's higher nutritive value, considered potentially beneficial for treating malnutrition in many parts of the world. Consumed as a cooked whole food, quinoa contains vitamins such as B vitamins like riboflavin, thiamin, B6 and folate as well as the minerals magnesium and iron. 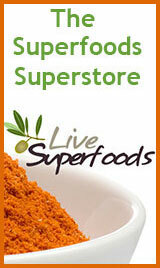 It also provides slightly more calcium, potassium and zinc in contrast to other staple grains. Because quinoa seeds do contain some phytic acid content, which can bind to certain minerals and reduce their absorption, it is often beneficial to soak and rinse the seeds for a brief period of time before cooking them. Some suppliers also provide dry whole grains that have been pre-soaked, also referred to as pre-sprouted, to enhance nutritional assimilation. One cup of cooked plain quinoa contains about 30% the adult RDA for magnesium, 15% RDA for iron and 19% RDA for folate, based on a 2,000 calorie diet. Alter Eco - Organic, Fair Trade, heirloom variety grown in Bolivia. Ancient Harvest - USDA Organic and Non-GMO Project Verified grown in Bolivia. 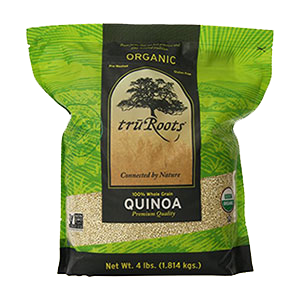 TruRoots - USDA Organic and Non-GMO Project Verified from Bolivia or Peru. 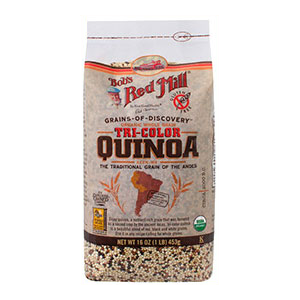 Bob's Red Mill - USDA Organic quinoa grown in Peru and Bolivia. 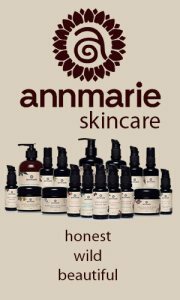 Viva Naturals - QAI Certified Organic and Non-GMO Project Verified and is a product of Bolivia. 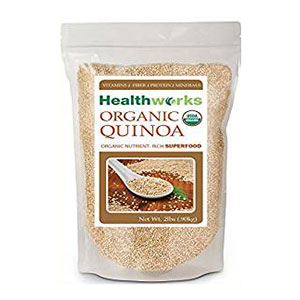 Healthworks - USDA Organic and grown in Peru. Eden Foods - OCIA Certified Organic is grown in Bolivia, Peru and Ecuador. 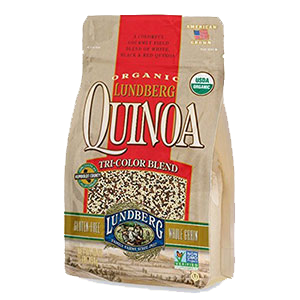 Lundberg - USDA Organic and Non-GMO Project Verified quinoa, grown in a coastal region of Northern California. 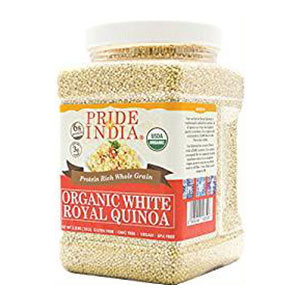 Pride of India - USDA Organic by OEFFA and is grown in Peru. 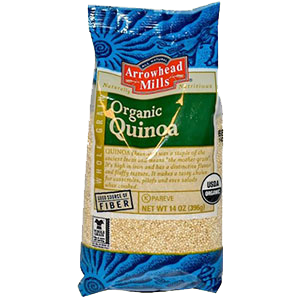 Arrowhead Mills - USDA Organic and Certified Organic by the Texas Department of Agriculture and is grown in Peru. 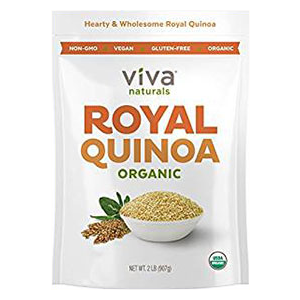 The best quinoa, in our opinion, is the white variety as opposed to the red or black types which tend to have a more fibrous texture and noticeably different flavor. This is of course a matter of personal taste, but if you are new to quinoa we highly recommend trying just straight white quinoa before other colored selections. White quinoa has a mild nutty pasta-like taste and can be consumed by itself, like a bowl of rice, or is very versatile for use in recipes. Quinoa is particularly popular these days for use in tabbouleh or salads using raw vegetables and fresh herbs. We use it in our Mediterranean quinoa salad recipe. Seeds can be sprouted as a substitute for wheatberries to make the fermented drink rejuvelac or cooked like oatmeal as a gluten-free breakfast porridge. When making your own DIY quinoa flour, we recommend soaking the seeds for a brief period of time, drying them in a dehydrator and then grinding them into a fine flour. This will help to reduce phytates and also any residual saponin content. Freshly harvested quinoa grain can be heated on a hot skillet to produce a puffed grain, similar to popcorn. Puffed quinoa is commonly used in commercial products like protein or chocolate bars to add a crunchy texture. Cooked quinoa is a very nice way to thicken soups and stews. It also makes a tasty addition to homemade tempeh in combination with assorted legume types. 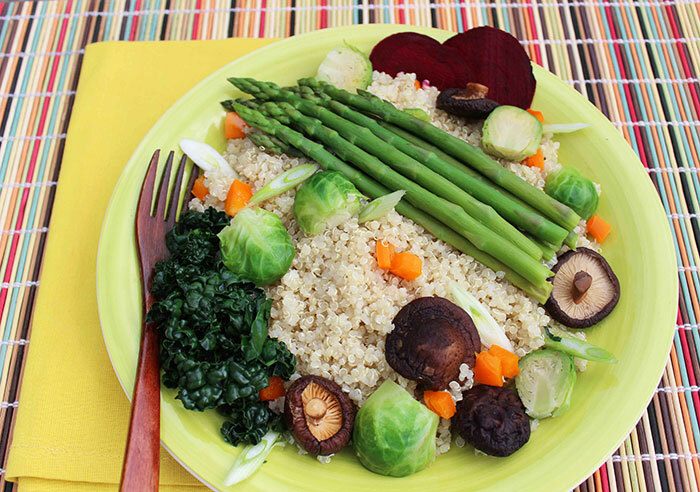 The best quinoa is cooked from the whole grain as opposed to refined flakes or pastas. 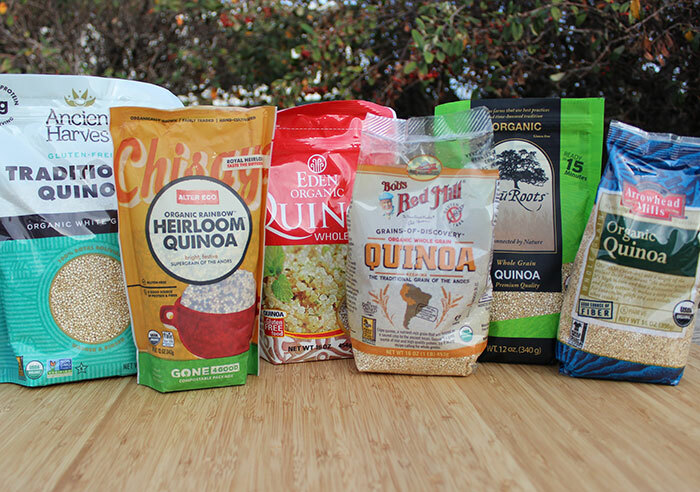 However, packaged quinoa products can be much healthier alternatives over other glutenous grains, depending on your current dietary practices. Optimal cooking times can vary, depending on personal taste preferences. In our opinion, however, most people undercook quinoa and add too little water per dry grain. Most websites suggest a 2:1 ratio of water to quinoa. While this decreases the cooking time a bit, it also produces a partially crunchy texture indicating the seeds are basically undercooked. We personally prefer a cooked quinoa that is thoroughly steamed with a soft and somewhat fluffy consistency. To achieve this, we use a 2 1/2 cup water to 1 cup of quinoa, instead of the standard quinoa recipe proportions. These amounts may, of course, vary somewhat if the seeds are soaked for a period of time. 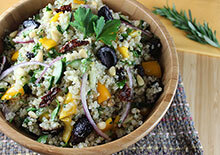 For more information about how to cook quinoa visit our quinoa recipe page in the link below. Quinoa is considered a safe staple grain to consume on a regular basis. In rare cases, however, some individuals are sensitive to saponin residues that may be present in the uncooked seeds, which can cause mild digestive upset. This effect is usually avoided by soaking and rinsing techniques as well as by thoroughly cooking the grain before consumption.